Do You Need a Yard Drainage System Installed in Your Home? One of the biggest problems homeowners experience during heavy rainfall here in the Edmond, Oklahoma area is flooding on the property. Heavy rainfalls for extended periods of time over power the rain gutters and cause water to begin to pool up near the foundation of the home. That water in time can cause significant damage if it is not draining away from the home properly. Our team at Bill’s Custom Concrete and Drainage Solutions has almost four decades of experience when it comes to building a drainage system to remove that water quickly and efficiently. 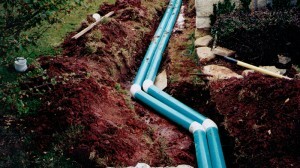 We can stop by your home and provide a free consultation on the best drainage system for your Edmond, OK property. 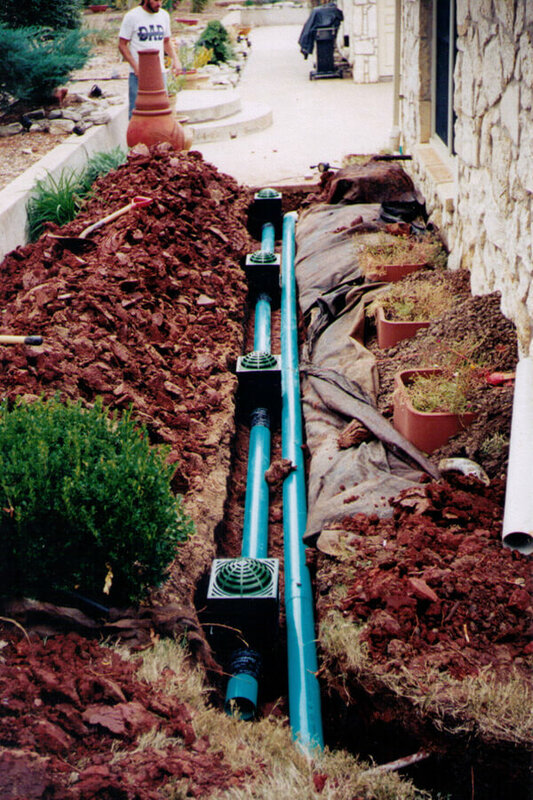 Our drainage systems specialists in Edmond ensure that you will be informed of the process from the initial consultation right to the final installation. The team at Bill’s Custom Concrete and Drainage Solutions always strive to meet or exceed the expectations of all of our customers. The reason we have been providing drainage systems in Edmond for so long is because providing exceptional customer service will always be priority one with each and every member of our team. 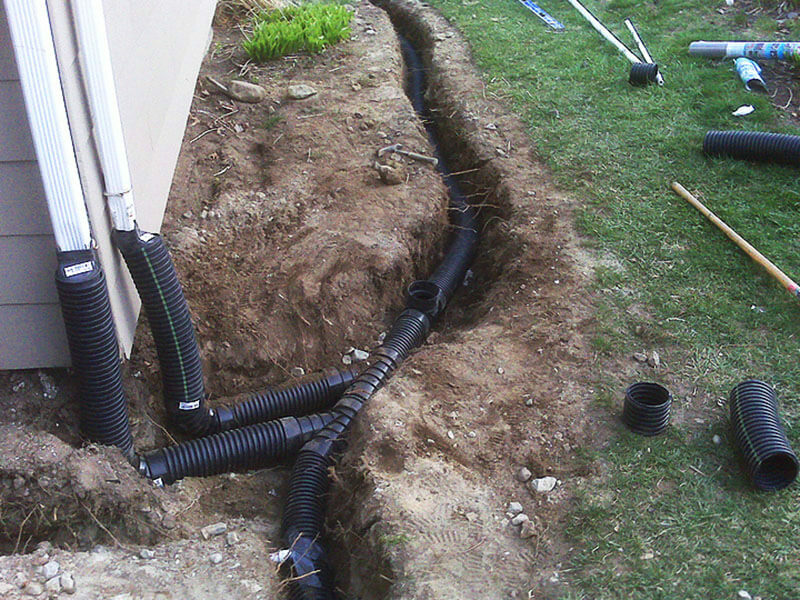 Whether you need a French drainage system, grading of the yard, or a number of other underground drainage solutions, our specialists will ensure that the job is completed to your satisfaction. When we begin to install your new drainage system, we always make certain that the slope of the drains is at the proper slope. 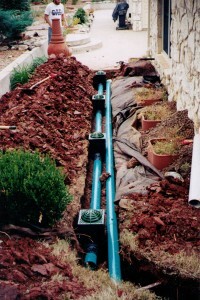 This will allow water to always flow freely and help to prevent any clogging of the drainage system. We can install a six inch pipe system if necessary to remove excessive water buildup much more quickly. One area we go above and beyond is when we install a backup system in the event the main drainage line gets clogged with leaves. Although we do not install rain gutters, we highly recommend to all our customers you have a professional install your gutters to get the rain from the house down and away from the foundation of the home. Incorrectly installed rain gutters can lead to water damage in the wood near the roof as well as to the foundation. Many times there is a simple solution like the use of gutters that we can recommend even if it means that we don’t get your business. We offer these suggestions as a courtesy to the residents of Edmond to help lower their eventual repair costs from water damage. One of the problems many homeowners in this area experience is from improperly graded landscaping. Water quickly begins to gather up against the home and the foundation. If the home has sloping that goes towards the house rather that away from it, you can expect that water will certainly begin to collect very easily even after the slightest rain storm. Our Edmond drainage systems professionals have the expertise to grade your property in a way that way flows away from the home and safely off your property. Water can easily begin to compromise the structural integrity of the home if not addressed in a timely manner. In addition to all the damage, water breeds mold and mildew which can become unsightly in only a short amount of time and can be very expensive to remove properly. Call our specialists at Bill’s Custom Concrete and Drainage Solutions today at (405)755-3975 for a free consultation to determine the right yard drainage system to use for your Edmond home. Our team will be more than happy to analyze your property and point out all the areas of concern that we identify. We look forward to helping you with your yard drainage issues, and ensure when the job is complete it will improve the flow of water the next time it rains.